Decorations that everyone looks forward to each holiday season. To be sure, there are lots of reasons that Christmas is such a special and unique time of the year for everyone. But part of the appeal of Christmas is the universal celebration of the holiday. Everyone gets involved - including businesses and cities. Christmas lights and decorations on display. That's because it's a rare municipality that doesn't delight its citizens and attract hordes of visitors with a spectacular public display of Christmas décor. Businesses get into the holiday spirit, too - all businesses; not just those that need to attract a steady stream of traffic to support retail sales. All businesses benefit from the public goodwill generated by a magnificent Christmas display. That's why you're as likely to see a wonderful Christmas display in the lobby of an accounting firm as on the storefront of a retail business. Christmas Trees. Christmas trees certainly belong at the very top of the list. After all, no Christmas display - private or public - can possibly be considered complete without a Christmas tree. For hundreds of years, Christmas trees have served as the traditional focal point of holiday celebrations. These days, both businesses and municipalities rely upon the unprecedented combo of beauty and durability represented by modern commercial Christmas trees. With so many colors and sizes to select from - including trees that soar up to 100 feet in height - there's a just-right commercial Christmas tree for every city and business. Commercial LED Lights. 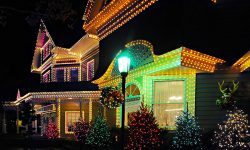 Christmas lights, of course, have been the mainstay of holiday decorations for many decades. 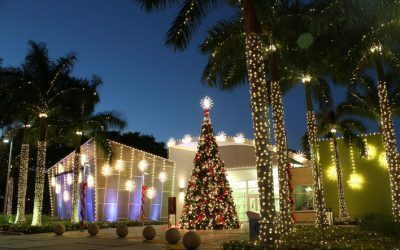 But thanks to some recent advances in lighting technology, savvy businesses and municipalities seek out a particular type of Christmas lighting: LED lights. LEDs offer a host of benefits that the old-fashioned incandescent lights just can’t match. 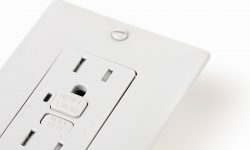 Those benefits include great energy efficiency, incredible durability, and a vibrancy of color that causes old-style incandescents to pale in comparison. 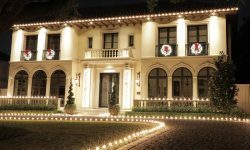 But there's a particular type of LED light that's best suited for commercial and government purposes (and for most homeowners, for that matter): Commercial-grade LED Christmas lights. Commercial-grade LEDs offer the very best quality that's available in LED lighting technology. Governments and businesses that invest in our Pro Series commercial-grade LED lights will save money in the long run and endure fewer maintenance-related headaches. And they'll enjoy better quality displays. Pole-Mounted Decorations. Christmas-themed pole-mounted decorations have the power to turn an ordinary street into an enchanting holiday thoroughfare. 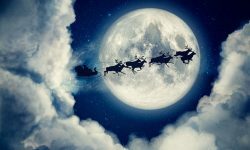 Images of Santa, Rudolph, stars, snowflakes, angels, and many other symbols of Christmas happiness seem to float overhead as passers-by stroll joyfully beneath. They can be mounted on virtually all types and sizes of light poles, utility poles and telephone poles. And most pole-mounted decorations can also double as building front decorations. Greenery. No Christmas decoration is complete without a touch of green. That applies to public displays as well as private displays. Commercial Christmas wreaths can add a complimentary finishing touch to a public display. But they can also add a big, bold "Hey, it's Christmas!!" statement with wreaths of up to 12 feet in diameter. Christmas garlands have served as traditional holiday décor stretching back through centuries. Garlands are often used to 'tie together' Christmas decorations into a cohesive, awe-inspiring display. Though green is a traditional color for garlands, they're also available in a rainbow's array of other colors. No other form of holiday décor is more versatile than Christmas garlands. Sign Enhancers. How will your signage possibly compete with all the grand holiday décor that everyone will be gawking at? Simple! Instead of competing with the holiday décor, your signs will contribute to the display with sign enhancers. Our sign enhancers are composed of elegant and charming Christmas-themed designs lit with dozens, even hundreds of LED Christmas bulbs. 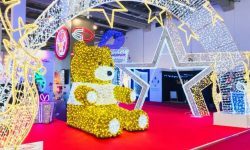 And while sign enhancers are perfect for helping your signage stand out in a sea of Christmas displays, they're also perfect for decorating and highlighting entrances. Light Pole Banners. While certainly decorative, light pole banners are also highly functional. That's because they can be used to deliver a message in a decorative, visually spectacular manner. Maybe the message is a simple "Welcome." Perhaps it's a message of holiday cheer. Or perhaps it's your own custom message, such as announcing a special event, or displaying your city or business logo. Whatever the message, whatever the theme, light pole banners are a traditional form of holiday décor that always makes the must-have list of favorites. And because they're so easily customized, light pole banners are used by both businesses and municipalities throughout the year - not just during the holiday season. By their very nature, lists are exclusive. Compose a 'top' list of anything, and many difficult choices will have to be made. Name your top 6 favorite songs, for example, or your top 6 favorite foods. You'll probably have to agonize a bit about which items to leave off the list. The same is true for our list of the top 6 decorations for cities and businesses. There are many wonderful candidates for consideration. But visit any public Christmas decoration this holiday season, and you're likely to find all 6 of the above components on display.